In 2003 Kevin Suedmeyer, Field Meet Chairman of the North American Falconers Association, asked falconer/veterinarian Dr. Ken Riddle's help to present an international falconry program by obtaining an authentic, traditional Bedu hunting tent for display. Dr. Riddle had worked in Abu Dhabi from 1985 to 1998 where he designed and directed what became a world-renowned falcon hospital at the invitation of His Highness the late Sheikh Zayed bin Sultan Al Nahyan, then President of the United Arab Emirates. Sheikh Zayed was a life-long, ardent, practicing falconer who achieved international prominence for falconry in 1976 when he hosted the first International Conference on Falconry and Conservation. 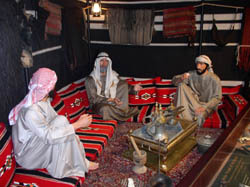 Through the generosity of His Excellency, Mohamed Al Bowardi, the Managing Director of Abu Dhabi's Environmental Research and Wildlife Development Agency and a falconer himself, the tent and all its traditional fittings, including wall-to-wall oriental carpets, cushions, and the complete accoutrements for roasting, grinding, brewing, and serving traditional Bedu coffee, were given to Ken personally for use at the meet. Evenings, falconers gathered in the tent set up in the courtyard of the Amarillo meet hotel for a review of the day's hawking, much the same way as Bedu falconers have for hundreds of years. At the conclusion of the meet Dr. Riddle generously donated the tent and all its accoutrements to The Archives of Falconry. TAF received a grant from His Highness, Sheikh Mohamed bin Zayed, Sheikh Zayed's son, to construct a new wing at The Archives for this goat-hair hunting tent to be properly displayed, so that all falconers might enjoy a glimpse of falconry as it has existed for so many centuries. 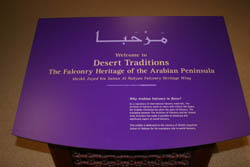 This new wing commemorates the memory of his father's great love of falconry and allows us to display memorabilia surrounding the long traditions of Bedu falconry and its contribution to all falconers' heritage. The wing was dedicated at the special celebration of TAF's twentieth anniversary in 2006. 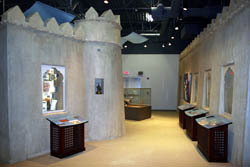 In the right sidebar are some photos of this new wing with exhibits designed by AldrichPears Associates. 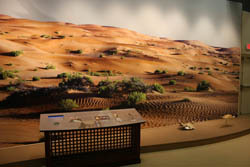 Wall mural with interactive audiovisual kiosk describing Arab falconer's hunt. Display windows and interactive audiovisual kiosks. Life-sized mannequins inside the Arab Majlis tent.